July 22, 2015, 2:37 p.m.
By Madeline Welsh @madelinebwelsh July 22, 2015, 2:37 p.m. Yesterday we wrote about The Salt Lake Tribune’s new membership program, but even after that post went live, we had more questions about the specifics of the thought process behind the program, and how it’s working out so far — the hows and whys, if you will. After playing phone tag, I reached Salt Lake Tribune editor and publisher Terry Orme this morning and asked him how it’s going so far. Orme was refreshingly candid about his and the Tribune’s reasons for starting the program, at one point admitting that many of the decisions made in launching were made on gut instinct. Halfway through the membership program’s first week, Orme says they’ve reached triple-digit signups — so, more than 100. There are two tiers of membership — $4.99 a month for invitations to a series of events or $9.99 a month for that plus no ads on sltrib.com. Orme says that by an overwhelming margin, readers are joining at the higher price point — something he attributes to an overall dislike for the advertising experience. Here’s a lightly edited version of our conversation. Madeline Welsh: So you launched this new membership program on Monday. Can you tell me why you decided now was the right time? Terry Orme: Basically, like other newsrooms and papers our size, we are technologically challenged. I only have so much development muscle, and to be frank, we got it up as soon as we could. We started talking about this program in March or sometime in late winter or early spring and what it would look like. We’ve been doing events for a while now and they’ve been popular, but the ad-free piece of it, that took some tech muscle to make happen. It took a while to get that figured out, and built, and tested. Here’s a rationalization for why it’s mid-July and we are doing this now: We knew there would be hitches, bugs, questions, and things might not work totally well, and we didn’t want to wait until fall when traffic gets higher. We wanted to get it going as soon as possible, which gives us some cushion to then push hard from September and do a second round of promotion. Welsh: Do you have numbers on how many people have signed up in the two days since launch? Orme: People are signing up. Not thousands, but we have eclipsed triple digits. For being up for two days, I’m happy with that. We had no idea what the response would be. Our model is to grow it over time and hopefully hit the place we want to be, but we’re in uncharted water. The fact that people are paying attention, are talking about it and writing about it, gives me optimism. This isn’t going to be the thing that saves journalism or The Salt Lake Tribune, but I think it’s another oar in the water. We’re piloting a kayak and kind of moving along to do our jobs. Welsh: Do you have a number in mind you’re hoping to reach, either in revenue or percentage of readers who become members? Orme: I’m going to be a little bit coy about the numbers. But we want to be in the six figures in revenue, but we’re going to go as high as we can. In percentages, we are looking to get between 0.5 and 2 percent of our monthly unique visitors who click on more than five stories per month. Our [overall] uniques are in the neighborhood of 3 million per month. Welsh: In your column, you said that the membership program was targeted at frequent visitors. What does that mean? Orme: The screen that invites you to become a member shows up after you click on five stories. If you click “No Thanks,” then it goes away. When you click through to 15 more stories, you get it again. If you click “No Thanks” again, then you don’t get it for a month. We don’t want to annoy our readers. We want to be unobtrusive, but also give them the frequency to let them know what is going on. Welsh: One of the interesting parts of this membership program is the two price points. How did you decide to have both options? Orme: The smaller number is just to have two options. We are trying to play on the goodwill that the Salt Lake Tribune has in Utah — and we can honestly and easily say that The Salt Lake Tribune is valued here. People like what we do and want us to continue. So we are giving them an inexpensive option and a more expensive option. Welsh: How did you decide on those amounts? Did you hire anyone to consult on what prices to ask for? Orme: We made it up ourselves! We just tried to talk it through. We’re not marketers and we admit that, and so that could prove to be a problem. We’ll see. Welsh: Which option is the more popular? Orme: By a margin of 20 to 1, people are choosing the more expensive option. People like a website without advertising. Welsh: There are rumors that the Tribune is going to be sold. Orme: Those rumors have been in place for a year. Our owner, Digital First Media, has been pretty publicly on the sales block for a while and there have been people speculating that we will be purchased by a local owner. We have traditionally been locally owned before MediaNews Group and then Digital First bought us. But it’s speculation. Nothing is for sure. Welsh: Has there been pushback on the decision to make the print subscription and digital membership separate? Orme: There’s been pushback from the print readers and people saying “I’m paying for a subscription, how come I don’t have access?” A little bit of that is they are familiar with the New York Times model, where they get the Sunday Times and get unrestricted access to digital. We thought about it, but the big difference is we aren’t restricting access to the web. It’s still free to read all of our stories. So you need become a member to get an ad-free site. That’s just a decision we made, and I don’t expect to change that. 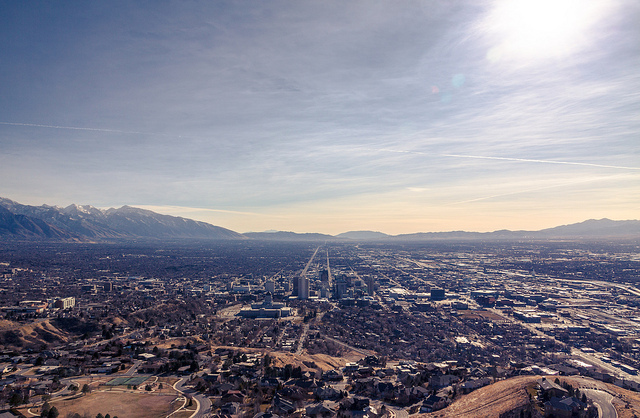 Photo of Salt Lake City by Andrew Smith used under a Creative Commons license. POSTED July 22, 2015, 2:37 p.m.
Welsh, Madeline. "“People like a website without advertising”: The thinking behind a newspaper’s ad-free membership." Nieman Journalism Lab. Nieman Foundation for Journalism at Harvard, 22 Jul. 2015. Web. 18 Apr. 2019. Welsh, Madeline. "“People like a website without advertising”: The thinking behind a newspaper’s ad-free membership." Nieman Journalism Lab. Last modified July 22, 2015. Accessed April 18, 2019. https://www.niemanlab.org/2015/07/people-like-a-website-without-advertising-the-thinking-behind-a-newspapers-ad-free-membership/.